Hakeemullah and Waliur Rehman Mehsud, before the Pakistani Army launched the South Waziristan offensive. A version of the article was originally published at The Daily Beast. 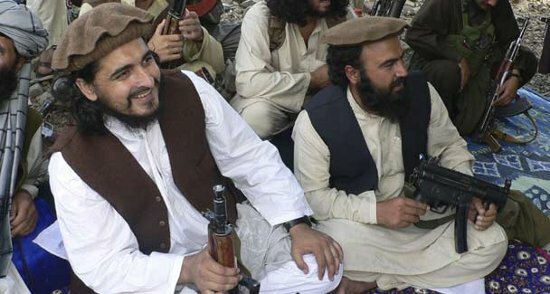 After years of effort, the US has finally succeeded in killing Hakeemullah Mehsud, the leader of the al Qaeda-linked Movement of the Taliban Pakistan, in the latest drone strike in Pakistan’s tribal agency of North Waziristan. Hakeemullah, who was responsible for numerous attacks in Pakistan and Afghanistan as well as the failed attempt to detonate a car bomb in Times Square in May 2010, was killed just as the Pakistani government was formally opening negotiations with the terrorist group. While the Taliban have not released an official martyrdom statement for Hakeemullah, an official spokesman known as Shahidullah Shahid told Pakistani reporters that the emir is indeed dead, according to the SITE Intelligence Group. The Muhajideen Shura in North Waziristan also threatened to attack the Pakistani state and military to avenge his death. Hakeemullah was killed today by the remotely piloted drones as he left a mosque in the town of Darpa Danday Khel, a hotbed of al Qaeda, Taliban, and Haqqani Network activity in the jihadist-controlled tribal agency. Hakeemullah was not the first jihadist killed in the village; on July 2, US drones killed an al Qaeda military trainer and a Haqqani Network leader there. US drones are responsible for both the rise and the demise of the slain Pakistani emir. Hakeemullah was promoted to lead the Movement of the Taliban in Pakistan after his predecessor, Baitullah Mehsud, was killed in a US airstrike in August 2009. Before his promotion, Hakeemullah led the Taliban in the nearby tribal agency of Arakzai. He was made famous after he appeared in a video driving a US Humvee that had been hijacked from a shipment of military supplies destined for Afghanistan. Two months after Hakeemullah rose to lead his Taliban faction, the Pakistani military launched a well-telegraphed offensive to eject Hakeemullah’s forces from the tribal agency of South Waziristan. The Pakistani military has touted the success of the operation, but four years later the tribal agency is still contested. Hakeemullah and other top leaders of the group fled South Waziristan and sheltered with nonaligned Taliban factions in North Waziristan; none of the group’s top leaders were killed or captured during the operation. But the US has succeeded where the Pakistani military and intelligence establishment has failed. Top leaders of the Movement of the Taliban in Pakistan, as well as leaders and operatives from al Qaeda and other terror groups based in the area, have been killed in the US’ drone program. Earlier this year, the US killed Waliur Rehman, Hakeemullah’s deputy. The death of Hakeemullah is certainly a victory for the US, but a tactical one at best. With the deaths of Hakeemullah and Waliur Rahman, the Pakistani Taliban are forced to scramble to replace their top two leaders. But the timing of the strike may cause a backlash from Pakistani officials, who have demanded that the US end the program. Just yesterday, the Pakistani government announced it formally opened negotiations with the Movement of the Taliban in Pakistan. The death of Hakeemullah is sure to sabotage the talks. Moreover, the US drone program has failed to halt the spread of al Qaeda, despite having killed more than 95 top al Qaeda, Taliban, and allied jihadist leaders in Pakistan alone since the first strike was launched in 2004. Al Qaeda has established new affiliates in Syria, Somalia, West Africa, and the Egyptian Sinai over the past several years, while its affiliate in Iraq has regenerated after taking a beating during the US surge in 2007-2008. Hakeemullah was involved in a string of attacks in Pakistan and Afghanistan, as well as a failed attack in the heart of New York City. On May 1, 2010, Hakeemullah claimed credit for an attempted car bombing in Times Square; the bomb failed to detonate due to a problem with the triggering device. Had the bomb exploded, scores of New Yorkers likely would have been killed and even more wounded or maimed. Image of Hakeemullah Mehsud (left) and Humam Khalil Muhammed Abu Mulal al Balawi, the triple agent suicide bomber, (right) on a videotape released on the Internet. The former Taliban emir’s other most spectacular attack outside Pakistan took place on Dec. 30, 2009 at Combat Outpost Chapman in Khost province in Afghanistan. Hakeemullah sent a Jordanian jihadist whom CIA officials believed would provide information on the location of then-deputy al Qaeda leader Ayman al Zawahiri. But the Taliban’s triple agent detonated a suicide vest after getting on base, killing seven CIA officials and security personnel, as well as a Jordanian intelligence officer. Hakeemullah later appeared in a video gloating with the bomber over the plot. Hakeemullah had been reported killed in drone strikes on several occasions since 2009, and the Pakistani government even claimed he died in a fictitious battle with Waliur Rahman as they supposedly struggled for control of the Taliban after Baitullah’s death (the clash never happened). Most famously, he was reported dead in the beginning of 2010. Hakeemullah quashed that rumor, however, when his tape announcing the Times Square attack was released. In September 2010, the US added Hakeemullah, his deputy, and the Movement of the Taliban in Pakistan to its lists of terrorists and terrorist entities. The US State Department’s designation statement described the Pakistani Taliban as an al Qaeda affiliate. “TTP [ Movement of the Taliban in Pakistan] and al Qaeda have a symbiotic relationship; TTP draws ideological guidance from al Qaeda, while al Qaeda relies on TTP for safe haven in the Pashtun areas along the Afghan-Pakistani border,” State said.